PCC takes selected fields from IP header, and with the help of a hashing algorithm converts selected fields into 32-bit value. This value then is divided by a specified Denominator and the remainder then is compared to a specified Remainder, if equal then packet will be captured. You can choose from src-address, dst-address, src-port, dst-port from the header to use in this operation. 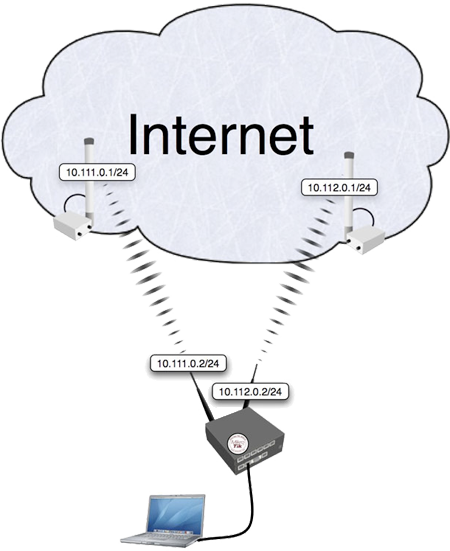 The router has two upstream (ISP) interfaces with the addresses of 10.111.0.2/24 and 10.112.0.2/24. The LAN interface has IP address of 192.168.0.1/24. With policy routing it is possible to force all traffic to the specific gateway, even if traffic is destined to the host (other that gateway) from the connected networks. This way routing loop will be generated and communications with those hosts will be impossible. To avoid this situation we need to allow usage of default routing table for traffic to connected networks. First it is necessary to manage connection initiated from outside - replies must leave via same interface (from same Public IP) request came. We will mark all new incoming connections, to remember what was the interface. Action mark-routing can be used only in mangle chain output and prerouting, but mangle chain prerouting is capturing all traffic that is going to the router itself. To avoid this we will use dst-address-type=!local. And with the help of the new PCC we will divide traffic into two groups based on source and destination addressees. Then we need to mark all packets from those connections with a proper mark. As policy routing is required only for traffic going to the Internet, do not forget to specify in-interface option. This page was last edited on 26 May 2017, at 11:44.